It can be difficult to find space to stamp your notary seal on a heavily-worded document. We understand how frustrating that can be, so we created the Self Inking Rectangular Notary stamp with you in mind! 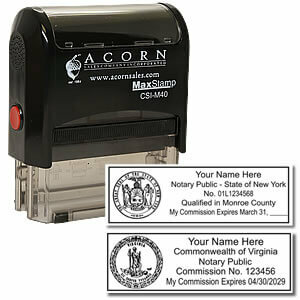 This durable self inking stamp is available and usable in almost all 50 states! Simply press your palm to the top of this stamp and push down with firm pressure, and you will have a perfect impression every time! The Self Inking Rectangular Notary stamp is a great addition to any notary's tool box. The Self Inking Rectangular Notary stamp is a true work horse because of its durability and its ability to be re-inked. Proudly display your commission and status as a notary public with this sleek and professional looking stamp. The Self Inking Rectangular stamp is not only easy to use but also easy to re-ink. This stamp is long lasting and can give you up to 5,000 impressions without needing to be re-inked. The size of this stamp is small enough to fit it comfortably in a pocket or briefcase. The standard clear base assures precision stamping every time it is used.